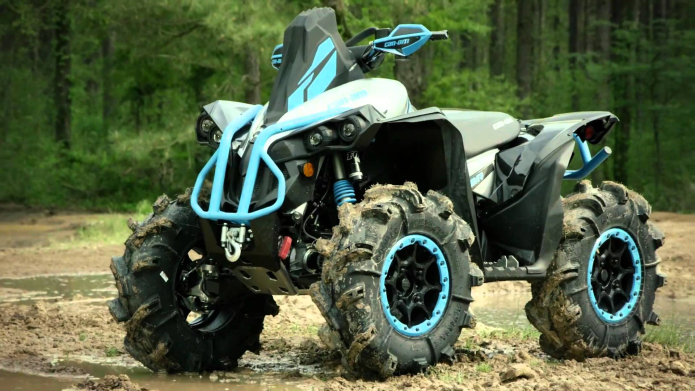 The last few months with the 2016 Can Am Renegade X mr 1000r have been time well spent. Once again, we utilized the trail system and epic mud pits at Anthracite Outdoor Adventure Area (www.aoaatrails.com) near Shamokin, PA to expose the X mr to the challenging muck it was specifically designed to conquer. Normally, I grab one of my skilled and trusted riding friends to accompany me out on the trails. We typically put time on the test machines, discuss our thoughts on the performance and handling, and of course…shoot a metric ton of action photography documenting the day. This time, however, I enlisted the help of my longtime pal, professional ATV racer, and off-road racing celebrity of sorts Chris Borich. This guy just so happens to be a six time pro GNCC national champion and the winningest ATV racer of all time! After spending the day wheeling the X mr with Borich, I believe we have an excellent evaluation in store.